Believe it or not, there are wrong ways, and the best way to cook bulk dried beans. Below is an easy and excellent technique. 1. 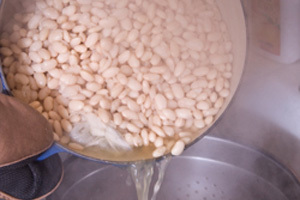 Rinse the dry beans. 2. Cover with 2x cold water. Cover and put in fridge for at least 8 hours, but no longer than 24 hours. 4. Put in pot with cold water. Or, for more flavor, use a mixture of 25% cold stock and 75% cold water with a bouquet garni. 5. Slowly bring to a low simmer. Simmer gently for 45 minutes, or until beans are tender. Check out our Cassoulet recipe and our Sausage, Escarole, and White Bean soup recipe for suggestions for how to pair beans with our game sausage. I never refrigerate mine when I soak them, I just leave them on the counter. Is there an advantage to refrigerating them? Hi Pam! We would really recommend storing them in the fridge for sanitation/safety reasons. Once you add moisture to dried beans they become far more attractive to bacteria. You’re kidding, right? You’re worried about bacteria in your soaking beans? This is not a realistic concern. You’re going to cook them. Many people recommend soaking in warm water to speed the softening. Either way, you’re going to cook them for 45 minutes or more. Good point, Jeanmarie … You are probably right, but we’ll err on the side of caution.